Orchids. I like them. They have an interesting look and the flowers bloom for a nice, long amount of time. This is part of why I like orchids, but I think I like them more due to the challenge it is for me to keep them kicking. I have trouble enough keeping regular plants alive so why I continually try (and fail) to keep orchids is beyond me. It’s cruel to the poor, defenseless orchid, plain and simple. This is my new office orchid, which I have had for a couple weeks now. It’s doing fine so far, but they always do at first. Give it time. I’ll kill the pretty little thing dead, I swear I will. 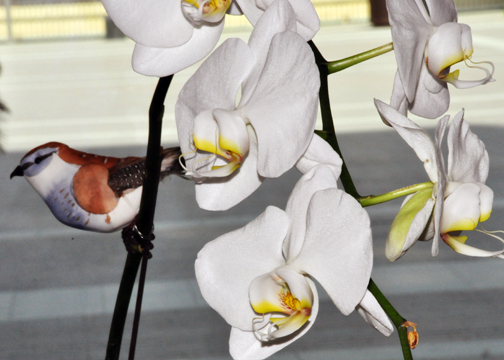 Added bird bonus: Check out the bird I saddled to the stem of the orchid. I was ridiculously tickled the other day upon making a purchase in Mulberry when they attached a bird to my shopping bag. I love little packaging details like that.